Note: This article is about the word meaning. For other meanings, see Fessée (magazine). 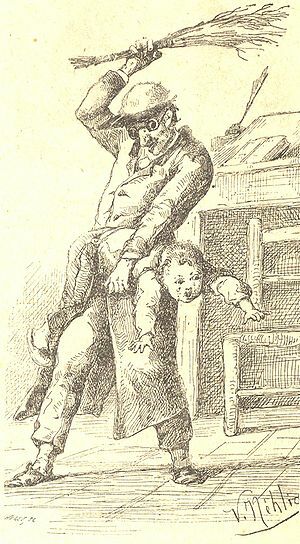 La fessée par l'instituteur ("The spanking by the teacher"), drawing by Victor Nehlig (1888). Fessée (pronounced /fɛ.se/) is the French word for a spanking (noun). Like the verb fesser ("to spank", pronounced /fɛ.se/), it is derived from the French word for buttocks, fesse (in singular, pronounced /fɛs/) or fesses (in plural, pronounced the same). Other words are similarly derived; for example a male spanker is called fesseur (pronounced /fɛ.sœʁ/) and a female spanker is called fesseuse (pronounced /fɛ.søz/). The word fesse, in turn, is derived from the Latin word fissum, which means "split", referring to the partedness of the buttocks. Whereas the English words "spank" or "spanking" do not directly refer to the body part upon which blows are to be given, the French words leave absolutely no doubt whatsoever as to what is to come. Anytime a parent or teacher has need to advice some culprit that he or she is to be spanked, reference is directly and openly made to the child's buttocks, intensifying the inevitable feelings of shame, rage and dread. La Fessée (1976) is a French softcore pornographic film with many spanking scenes. Watch a video clip or the complete film at xHamster. This page was last edited on 16 March 2019, at 05:01.